Staying in Marbella provides plenty of options for activities, whether you want to relax on the beach, rub shoulders with the rich and famous, or indulge in some of the watersports available. However, Marbella is also ideally placed to go exploring and there's a number of equally fascinating destinations that you could visit for the day. Here are a few suggestions of some of the places you might want to consider going to as a daily excursion. Lying just two and a half hour's drive from the heat of Marbella lies Sierra Nevada, Spain's most southerly ski resort. Perfect for both novices and experienced skiers alike, there's more than 100km of alpine runs as well as an ice rink, ski bikes and toboggans. Because of its extremely high altitude, the ski season runs all the way through to late May from November, allowing holiday makers to easily combine a sun and ski holiday if they travel on a day trip from Marbella. The region is still worth a visit in the summer months too, with horse riding, mountain climbing and hiking all enjoyable activities. A cable car and chair lift is kept open during July and August so that visitors can still reach the peak of Veleta (the area previously set aside for skiing). The views from the summit are breathtaking and if the sky is clear, you can see all the way across to Africa. Well worth the trip from Marbella. A sun lover's paradise, Tarifa is a resort which is simply exquisite. With crystal clear waters and white sandy beaches which stretch out for miles, it's just an hour and a half down the coastline from Marbella. A popular spot with kite surfers and surfers, there's also the opportunity to enjoy a mud bath before heading back to your villa in Marbella for the night. 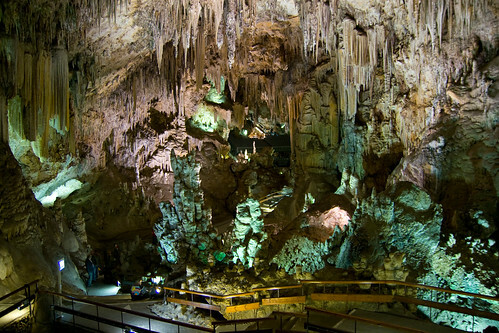 Often described as Spain's most important network of caves, these caverns were accidentally discovered in 1959 by five schoolboys who found them via a sink hole when they were looking for bats. The caves are thought to have been formed around five million years ago and skeletal remains which were found have revealed that they were inhabited by humans up until the Bronze Age at least. The caves had two natural entrances but a third artificial entrance has since been added to provide tourists with easier access. Lying near Nerja in the province of Malaga, the caves spread out over more than 3 miles, and it takes more than an hour to walk through the underground spectacle. The caves have been given fascinating names, such as the Hall of the Phantoms, which reflects some of the awe inspiring sights. These include the world's largest central rock formation as well as a series of columns which can be struck to produce different notes. These are believed to have been deliberated created by prehistoric man. Only parts of the caves are open to the public but music is played while you wander round and in the summer months, concerts are held in the venue, a truly eerie experience. Marbella has many things to see and do but if you want to visit the second biggest old town in Europe, you'll need to visit Cordoba. Scorchingly hot, it's best to avoid visiting in July and August due to the high temperatures, and if you travel in May you might be in time to experience one of the three festivals which take place. The mosque is arguably the most outstanding place to visit in the area, being originally a pagan temple dating back to before 600 AD. With 856 columns made from semi-precious stones such as onyx and jasper, its huge arches are a feat of architecture. You can reach Cordoba within 90 minutes by car from Marbella, but there's also rail and bus links from Malaga.